Independent Everything: LIVE with Hip-Hop Artist Rhyme Scheme of D.R.S. Ent. Meanwhile, early in his career, he was chosen as Artist of Tha Month on Soundz Taight – Tha Indie Spot, been featured on the cover of The Underground Fix Magazine, BWD magazine, XXL Magazine, and featured in the A&R Report of Urban magazine. With past works such as "Time Will Fly," "Four Letters of Love," and recently released "Business Over Pleasure" featuring Yukmouth and Young Noble, Rhyme Scheme shows no signs of slowing down. His brand new single released on April 7th "Critical Condition" featuring west coast legend Spice 1, Bad Azz, and Gwap Don Dolla Signs, is no doubt a west coast banger sure to stay playing for years to come. The track is lyrically reminiscent of the days when hip-hop was thriving on the west coast. There are many more projects to come including, "Progression EP," featuring lyricist Armageddon of the Terror Squad, and Mopreme Shakur, scheduled to release around June of this year. One of the biggest changes to the Rhyme Scheme movement is the development of his record label D.R.S Entertainment along with his business partner Tanisha White, owner of Cali Gurl Real. 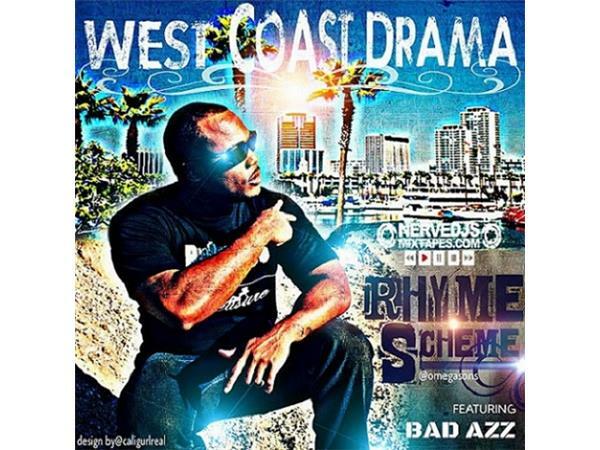 Join the Rhyme Scheme movement and breathe life back into the very Hip Hop that started it all.